A stunning bouquet featuring lavender roses and a green orchid placed inside the casket is a tender and very personal tribute. • The radiant arrangement includes one green cymbidium orchid, lavender roses, purple alstroemeria, green button spray chrysanthemums and green hypericum, accented with assorted greenery. 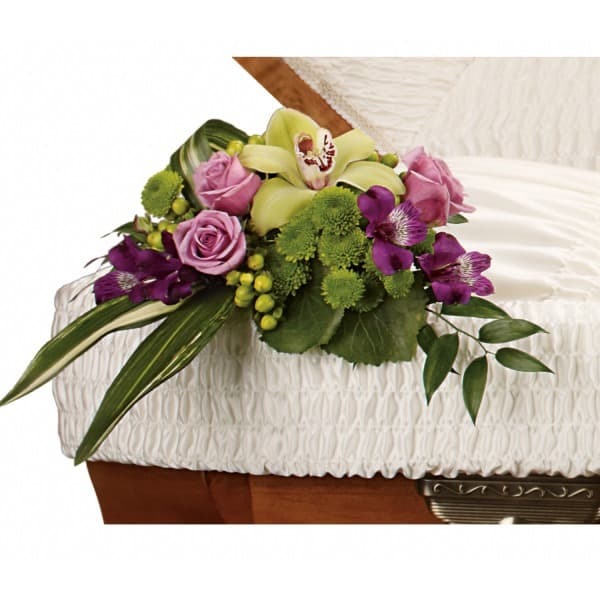 • Casket flowers are traditionally sent by immediate family members. • Delivered directly to the funeral home and placed into the casket. • Arrangement measures approximately 16 3/4" W X 10 3/4" H.
Flowers will be received by a Osceola Memory Gardens' staff. 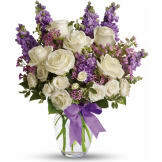 All of our flowers are designed and delivered by hand from a local florist in in Kissimmee.